Our business concept is simple. As a husband and wife team we will marry our passions for retail, quality, design, service and the environment into a jointly owned retail offering. We’re creating a niche sofa retail business that’s focused on delivering an interesting, extensive UK/European product range with interested, individualised service. We’ll blend Andrew’s industry knowledge, contacts and passion for retail with my service industry business acumen and drive. We aim to showcase the best UK upholstery manufacturing (yes, some still succeed) alongside selected European design and innovation. Add to the product mix a large dose of enthusiasm and positivity (it’s called customer service), we’ll deliver some much needed personality into the homogenised chains and online retailers. Choosing our trading name – our first activity – was lots of fun. It also turned into a waste of time when we discovered the names we’d chosen had been registered already with Companies House. School boy error, don’t repeat it. Start by accessing Companies House ‘starting a company’. Once you’ve registered your business and trading name, it’ll cost money. A real sign that you’re seriously committing to this venture… and whilst in form filling mode don’t forget to register for VAT. You may not need it but the chances are that you will. It took several weeks for ours to go through, easy. Spend as much time as possible getting your finances sorted out. Understand exactly what you are letting yourself in for. Cash flow projections need to be spot on; otherwise you’ll close down before you’re established. We spent hours working out our ‘best’ and ‘worst’ scenarios. And man, was it boring. We modelled ‘optimistic’, ‘pessimistic’ and ‘realistic’ data until Excel threatened to explode. Dull, dull, dull. However, in hindsight, taking a hugely realistic view of our first year’s trading was critical when presenting, successfully, to the bank. By the way, we chose a bank manager that was recommended to us by good friends who have their own business. He’s been engaged and positive throughout our pre-launch activities. Long may this positive relationship continue! Don’t be afraid to ask for help, advice, guidance and support. Do be prepared to return favours in the future. You reap what you sow. Contact your family, friends, ex-colleagues or peers. You’ll be amazed at how supportive everyone is, especially those in business themselves as they know what you’re going through. There’s a wealth of formal business start up support. We’ve found the recently launched Start Up Britain useful although I’d recommend working your way through the ‘offers’ to find what you really need. I’ve used Business Links too, as they’re pretty easy to work online with. Linkedin has been a great source of practical and virtual help, with a variety of interested and proactive support groups. Our ‘must-join’ forums are the Start Up and the Independent and SME Retailers Forum. I’m trying out sites such as Ecademy and I’ve had to learn to use social media. Twitter and Facebook are essential if, like us, you intend to try viral marketing. Everyone’s got an opinion and they will share it, especially if they think they’ve had a poor experience. Respond swiftly and appropriately to address or redress. After so many years in business, we’d love to think we’re fully capable of starting up our new venture with minimal help. The reality is that we are learning every day. Currently, we’re out of our comfort zone in a load of areas, especially with the website build. Help is needed; often we don’t even know that we need it. That’s the tough part but that’s also why we’re in business – if everyone could do it…. We’re also far too absorbed in our venture to be objective, so we need honest, timely feedback. My mate Andy has been a particularly generous provider of helpful opinions and ideas. Stay focused and stay in business. Return to the business plan constantly, that’s why you wrote it! We’ve been diverted time and again over the last few months. Each time, I pick up the plan and refocus. It so helps. Also helpful is to read an inspirational book or two. My current ‘must-reads’ are Scott Stratten’s UN Marketing and Shopping Why We Love It and how retailers can create the Ultimate Customer Experience by Pamela N. Danziger (try her test on her website). So, don’t get bogged down by problems, they’re inevitable. Find ways to overcome them. Don’t get disheartened. Things go wrong; find ways to sort them out. 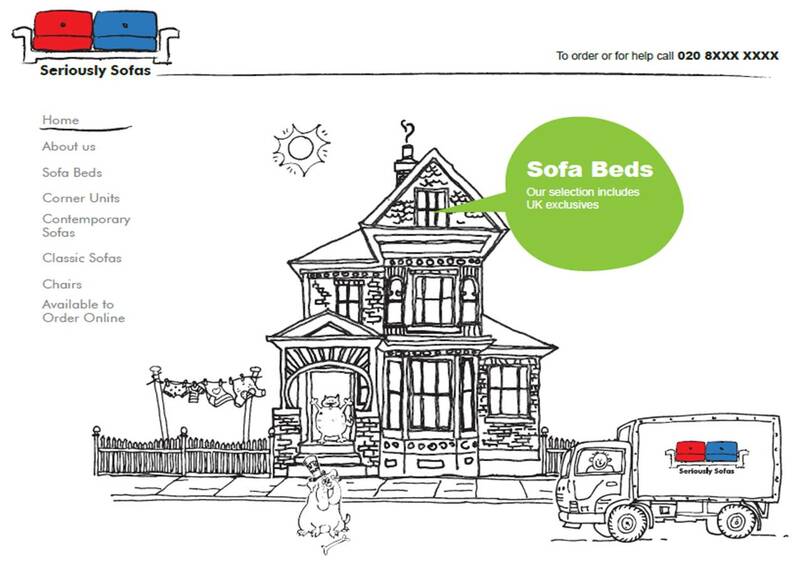 We’d hoped to have our website www.seriouslysofas.co.uk to trade online by now, but it’s not to be ( you can see the mock-up of the home page at the top of this blog though!). We know it’s essential to get it right so we’ll keep working on it. Instead we will phase our start up approach, adapting as we go along. Our advice? Keep in mind why you decided to take the plunge to start up your own business when things go awry, keep perspective and above all, enjoy it. It’s really satisfying to be creative and can be lots of fun. On that note, it’s time to sign off; I’ve a business to start up with my husband! March 2011 – a perfect storm. Andrew, an experienced upholstery retailer, and his manufacturing partner were increasingly heading in different business directions. Ruth was frustrated and bored in her HR role. A trip to New Zealand involved earthquake and trauma. Returning to the news of a colleague’s untimely death. With great clarity a decision was made, it was time to go into business together. Using the wealth of experience and contacts from 30 years retailing and business to start up a niche upholstery retail business, online and in the great British high street – Seriously Sofas was born! This entry was posted in Blog-a-day for Indie Retail, Independent Retailer Month 2011, Retail Strategy, robust repeatable processes, scalable, Service, The Retail Champion and tagged starting a retail business. Bookmark the permalink.